"Residence of L. Eckerson - Fawn River -Mich."
My great-grandfather, John Levi Eckerson, spent many years working his way from Michigan to Washington state, but there are few details of how or why he made the journey. In 1880, he is found described on the census as "boring wells," and living as a boarder. This was in Belvidere, Thayer County, Nebraska. This may not have been a random decision, because his great-uncle, Willard W. Morgan, had also moved there in 1871. In 1889, John L. Eckerson can next be found in the territorial census for Washington, living in Thurston County, single and working as a carpenter. An 1891 newspaper notice states that his leg was broken while loading heavy timber onto railroad cars in Centralia, Lewis County. He had evidently moved across the country living a rough and tumble existence. At the ripe age of 44, John L. Eckerson married 20-year-old Estella Channell in Lewis County, Washington. A newspaper account of the event states that she was "quite a catch." Perhaps they didn't quite understand her attraction to him, either! There is evidence that most of John Eckerson's siblings eventually moved west as well: his older sister, Helen Butz, and his brothers Frank and Ernest are all found in Washington and Oregon. When I began my journey in genealogy, I asked my grandfather, John and Stella's only child, Harold Eckerson, where his father had come from. The answer was always the same, "Hell's Half Acre!" This was his way of saying he had no clue. But if he'd bothered to look at the evidence, the answer might have been different. One of the items that somehow found its way west, was this photograph of the home in Fawn River, St. Joseph County, Michigan, where John L. Eckerson had grown up. His parents were Lambert and Harriet Graves Eckerson, who had come to Michigan from Western New York. 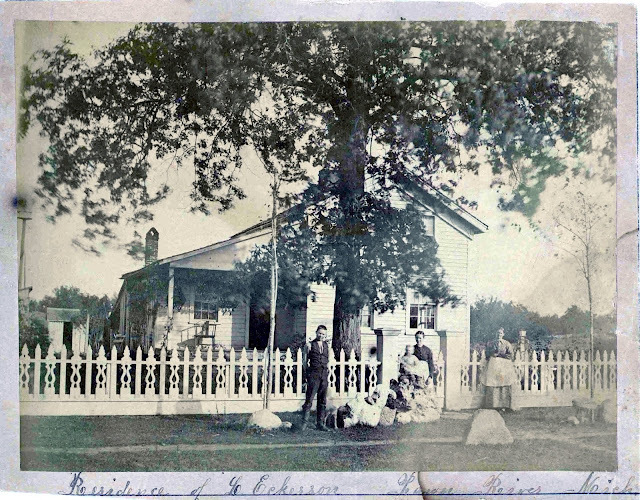 Thankfully, the photograph is clearly identified as being the residence of L. Eckerson. There is a teenager standing in the center of the picture. Is this John, on the cusp of his westward adventures?